Plans have been announced for an important forthcoming visit of the top Rotarian in Great Britain and Ireland to the Rotary district that covers Staffordshire, Shropshire and parts of the West Midlands. Eve Conway will be guest of the district for two days in February which, on the 23rd of the month, happens to be World Rotary Day. On February 20 she will be in Staffordshire helping the Rotary club of Stoke-on-Trent celebrate its 90th birthday. The following day she will be In Wolverhampton at a special event arranged to celebrate the centenary of The Rotary Foundation, Rotary’s own charity. Also that day Eve will be in Shropshire for a meeting of the county’s Rotary clubs at the Lord Hill Hotel, Shrewsbury, hosted by Shrewsbury Severn Rotary Club. She will hear what Rotary is doing locally to raise the profile of the movement through the 100th anniversary of its own charity and also its End Polio Now campaign. “It is an amazing, inspirational organisation that has transformed my life since the 1980’s and I am passionate about ensuring that we have a strong future,” said Eve. Eve, who started her Rotary career in the 1980’s, went on: “The world stands on the brink of a historic milestone and as we near the elimination of polio from the world we must focus our efforts on the final push to eradicate this disease to ensure a polio-free world. 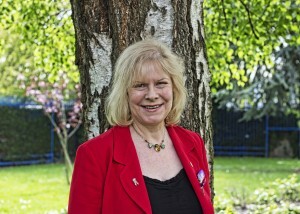 Eve, a past president of the Rotary Club of Redbridge, has held a number of positions within Rotary, one of which was the District Governor for Rotary in London. She has also created the Rotary International Young Citizen Award to encourage the younger generation to participate in helping their own communities.